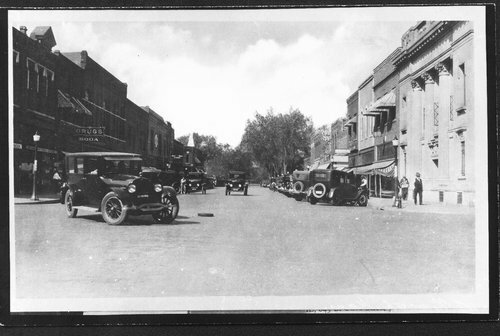 These photographs show street scenes in Ellsworth, Kansas. A drug store with a sign reading, "Drugs, soda," is visible in both pictures among the buildings on the left side of the street, and another drug store's sign is visible on the right side of the street. Both pictures show many automobiles parked or driving along the street, and several people are visible in both pictures. The second picture shows the street lined with American flags. Holding Institution: Wisc. Historical Society, 1967.